Home »Snowdonia»Wet and Windy it was!! The forecast was correct! The weather actually seemed relatively fine as we arrived at Capel Curig late on a Friday evening for a boys weekend. The most eventful bit of the journey was realising Phillip had mistakenly (I hope) bought two crates of zero-alcohol Becks beer for the weekend, which were duly left at Telford Services. Phillip also unpacked his tent to find no pegs so we shared what pegs we had between us, hoping the winds would stay away, though a fairly calm night was followed by a blustery and overcast morning. 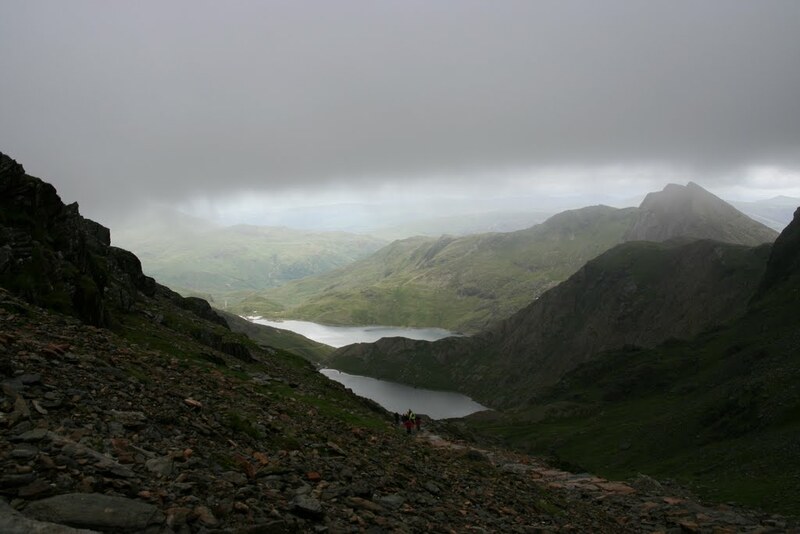 The guys wanted to ‘do’ Snowdon – I did explain that once you’d joined the tourist trek up there they’d realise they would be unlikely to return very often – but Snowdon it was to be. We were too late for a car-parking space at Pen-y-pass so back-tracked down the road and paid the princely sum of £4 for road-side parking and headed back up towards Pen-y-pass. It was not a good start as my ankle was immediately hurting, so we stopped at Pen-y-pass to add strapping to my ankle and for Phillip to fit his knee support. It wasn’t looking good as we were overtaken by a woman in stilleto’s and her 5 year old daughter! We headed up the Pyg Track so as to give us the option of Crib Goch. 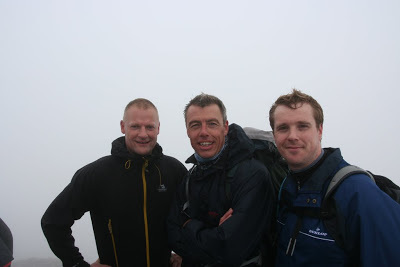 I was a little wary of taking responsibility even if conditions were ideal – Carl admits to being scared of heights and Phillip has a dodgy knee – not forgetting my dodgy ankle. As it was the weather put paid to the option, with wind and rain increasing Crig Goch seemed an unwelcoming proposition. The trudge up the Pyg path was as unremarkable as the view from the top! My ankle was holding up well but Phillip’s knee was giving him serious grief and he wolfed down more Ibuprufen. Dropping down the south-ridge we dropped beneath the cloud and the weather brightened a little. The climb up Y Lliwedd was fun, all the more so for seeing Carl’s face when he suddenly realised how near he was to the edge of a cliff!! As we descended to Llyn Lladar we found the shredded remains of a tent, probably abandoned during the 80mph winds of a few nights earlier. Phillip quickly noticed some tent pegs that were strewn around and which would come in handy later! That evening the wind and the rain really picked up and Phillip spend the night with the tent on his head and woke up in half an inch of water. The photo below shows the effect of the wind – he really ought to have guyed out those poles properly!! It’s a good job we found the extra pegs else he would likely have been blown to Betws-y-coed! I’m pleased to report the Laser Comp stood up well to the battering, I felt quite cosy hunkered down inside, though it was a little noisy at times – though I think Carl was safest in my trusty old North Face Tadpole. The atrocious weather (and geriatric knee problems) put paid to any thoughts of any more mountains on Sunday so we decamped to the Pinnacle Cafe for a well-needed, if not deserved, fry-up. A quick trip, good fun and I think they enjoyed it – though they haven’t spoken to me since. There was even mention of them being interested in a wild-camp trip, though that was in the pub so may well have been alcohol-fuelled. Time will tell! ← Previous Previous post: Wet and Windy! Next → Next post: New Heights! Not my fault. I stayed at home! Thanks Robin, I really ought to check where you're going to be before we plan weekends! I do agree with you both – a bit of weather adds to the experience. I love the different moods the weather gives to the mountains. 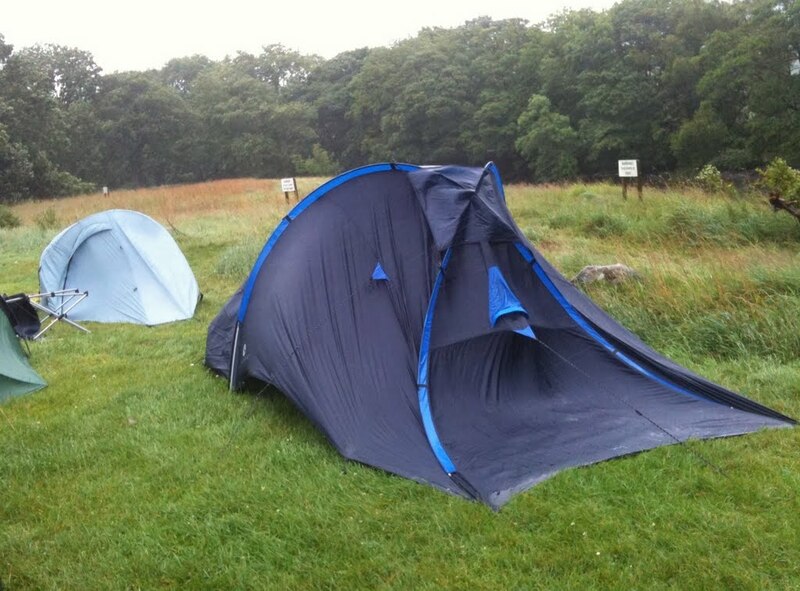 Cheers Jamie, I'm just glad we found those extra tent pegs! After your Blencathra trip it looks like I'lm going to have to add Sharp Edge to my list of 'edges' to edge along! Yes, the weather is so unpredictable but I think it is the greatest challenge to campers. As Maz have said, it adds to the drama. You just have to decide if you take the challenge or not.